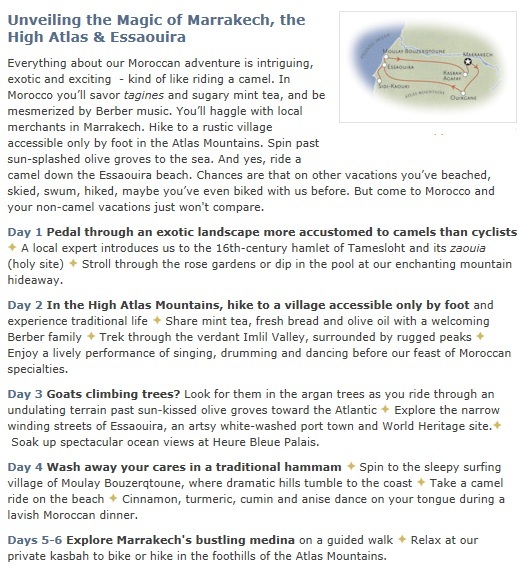 Call 1.800.330.8820 or click here to have an Adventure Travel Specialist contact you about booking this Morocco adventure vacation that takes you through quaint villages and on country roadsfrom Tameshlot to Marrakech on a fully supported biking trip. Mention promo code BKRD to access the most up to date pricing and upcoming travel dates on this Morocco adventure vacation. ~ by travelwizette on July 16, 2012.